Last Friday, while in Montreal, we found our hotel was close to the famous Fairmount Bagel factory. I had first heard of them while reading a recent issue of Gourmet magazine which highlighted the food of Montreal. In 1919, Isadore Shlafman arrived in Canada and opened the first bagel bakery in Montreal. It was located at the back of a lane, just off of Saint-Lawrence Boulevard, which was then known as "The Main". This is where Montrealers got their first taste of bagel, rolled by hand and baked in a wood-fired oven. 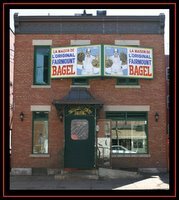 This was the very first bagel bakery in Montreal. In 1949, Grandfather Isadore move from Saint-Lawrence Boulevard over to Fairmount street. He bought a charming little cottage, and proceeded to knock down the back wall of the house, and built his bagel oven right there. He and his family lived upstairs, and when Grandfather Isadore went to work, he went downstairs and baked the bagel right there in his house. His son, Jack, learned the art of baking bagels and joined the business. They continued the tradition of rolling their bagel by hand, and baking them in their wood fired oven's. Since they were now located on Fairmount street, they renamed the bakery "The Original Fairmount Bagel Bakery". Today, the family continues to make their bagel using the same traditions and methods that Grandfather Isadore brought to us from the old country. All the bagel are still rolled by hand, and are baked in our old fashioned wood burning ovens. New bagel are introduced only once the texture and consistency would meet Grandfather Isadore's standards. His grandchildren still manage the business today.